THE YUCÁTAN PENINSULA is made up of three states: Campeche, Quintana Roo, and Yucatán, which also include major resort areas such as Cancún, Cozumel, and Playa del Carmen. 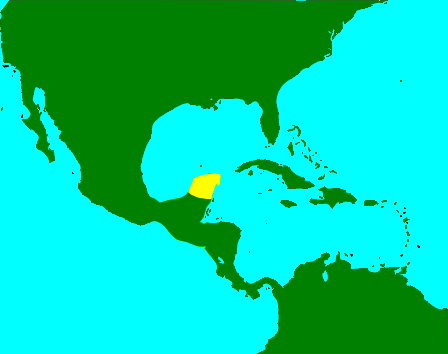 The Yucatán Peninsula extends northward from Central America and is bordered on the east by the CARIBBEAN SEA and on the north and west of the peninsula by the Gulf of Mexico. The Yucatán Peninsula measures 70,000 square mi (181,300 square km) and is considered a low, flat limestone tableland with coastal rocks dating back to the Pleistocene and Holocene ages; older deposits from the Miocene and Eocene ages are found farther inland. It is located in the southeastern part of MEXICO and has a tropical climate with summers that are often wetter then the winters. While a majority of the inhabitants of the Yucatán Peninsula are modern descendants of the Maya people, the area is also very heavily populated with tourists in the three major resort areas. Because of the region’s Mayan history, there are many ruins on the peninsula, of which the major sites are Chichèn Itzá, Cobá, Edzna, Kabah, Tulum, and Uxmal. The Mayan civilization, during its high period, occupied one-third of Mesoamerica. Trade between highlands and lowlands comprised what could best be produced in those areas. For example, the lowlands were generally producing food for personal consumption such as maize, squash, beans, chili peppers, amaranth, manioc, and cotton. The highlands, however, were often extracting heavy minerals, as it possessed obsidian, jade, precious metals, and hematite. Caves and KARSTs on the Yucatán Peninsula are plentiful and were well used by the residents because inland fresh water was and still is extremely scarce. Cave exploration by the Maya first occurred some 3,000 years ago in an effort to find fresh water. Today pottery shards, charcoal, torches, and artwork are all found in the caves. It is believed that the water in the caves was used not only for survival but for religious ceremonies as well. The caves themselves were used as a refuge from enemies, resting places, and in mining for clay and minerals.